All of these kids have families. All of these kids have homes in the US, and they have for years. And ye here they’re sitting, waiting, suffering. International adoption is known for it’s hefty price tag and frequently long duration. Why does it take so long when so many children around the world wait for forever families? This documentary follows three families through their international adoptions, and provides a very personal look at the joys and heartaches of the process. It also provides a glimpse at international laws and treaties that cause adoptions to be held up for years with very little reason. Yes, it’s true, I cried my way through this film not once, but twice. It’s heartbreaking to watch parents struggle against a convoluted system while loving children they can’t be with or take care of. And it’s wonderful (in a tearful sort of way ;)) to see these parents finally united with the children they have fought for. You can rent it for a week on Amazon or buy the DVD off the Both Ends Burning website. Want to know more? 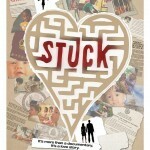 Read my friend Marli Renee’s blog post or watch the Stuck trailer over on the Videos page. What do you know about the cost and time involved in international adoption? What are your opinions on the subject?